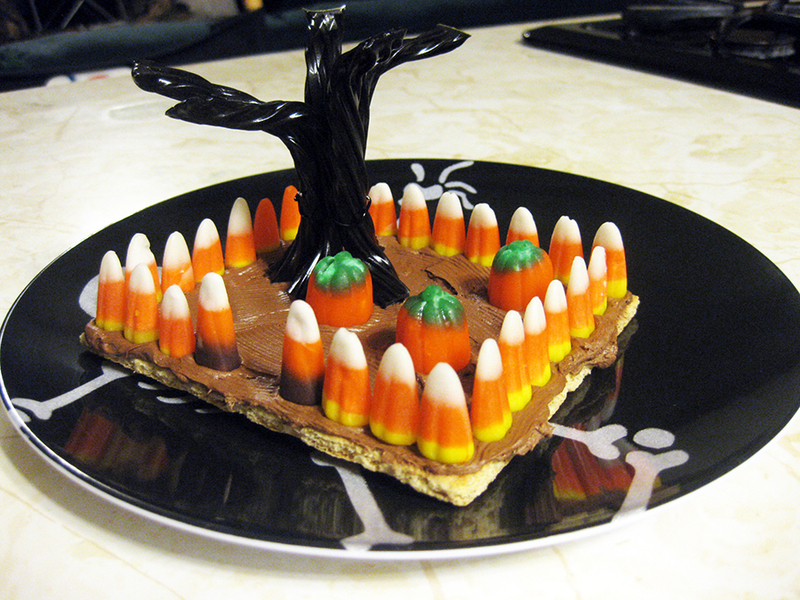 From now until Halloween, I’m going to try to post 1 themed recipe, edible craft, and craft each week. Needless to say, I love Halloween, and I’m getting into the holiday spirit early! I actually started working on my Halloween costume in July. 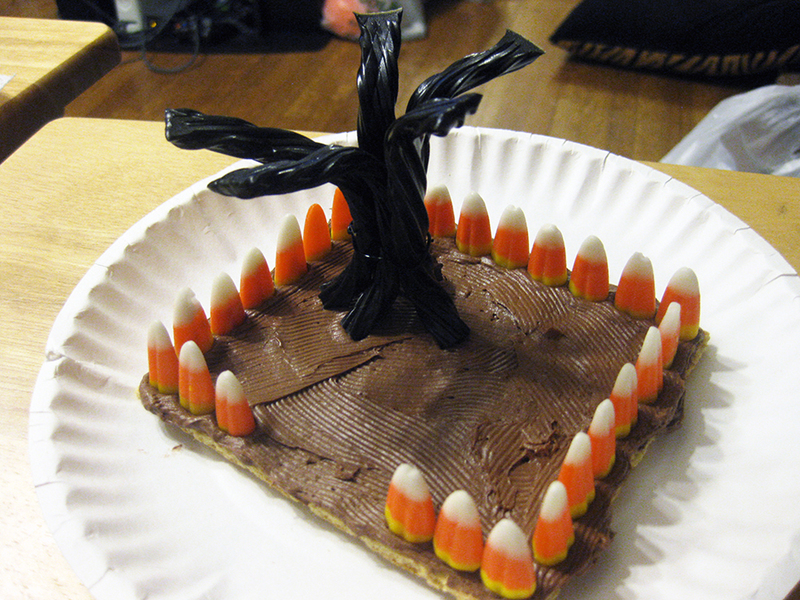 So, without further ado, Halloween edible craft #1: the (somewhat) Edible* Tree Centerpiece. Approximate time: 15-20 minutes. 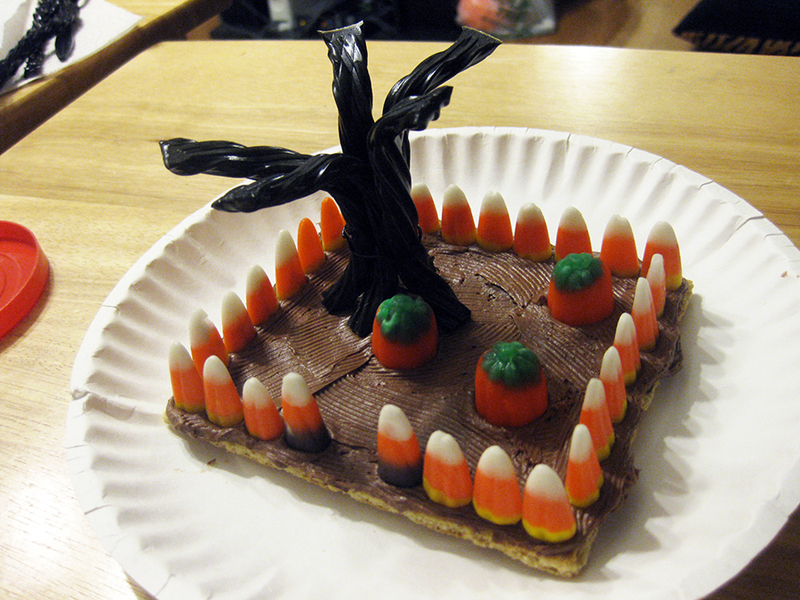 * Note: this recipe is “somewhat” edible because the tree itself has non-edible wire inside. So DO NOT EAT THE TREE!. This would make a great family craft for humans and pets. My cat was very helpful. 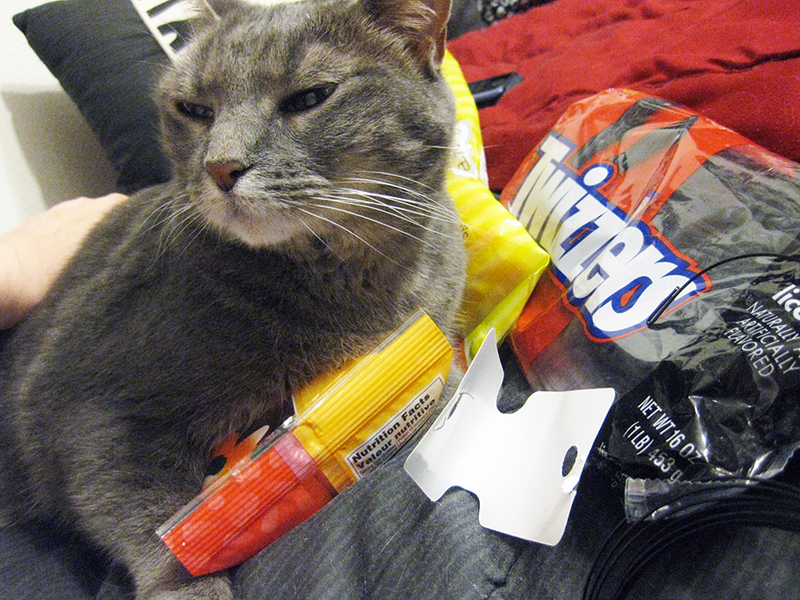 And by helpful, I mean she used the bags of candy as pillows. At least she didn’t try to eat the materials. 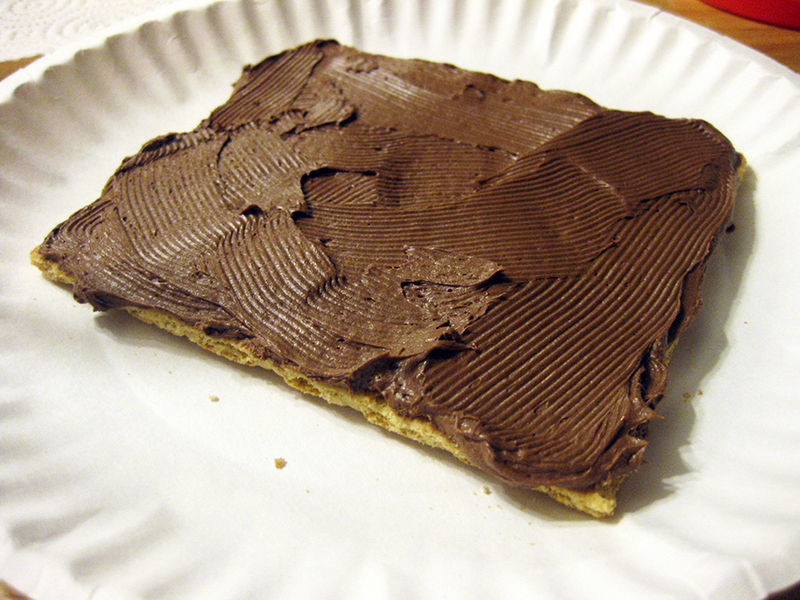 Step 1: Place two graham crackers side by side and gently spread a generous amount of chocolate frosting across both crackers. 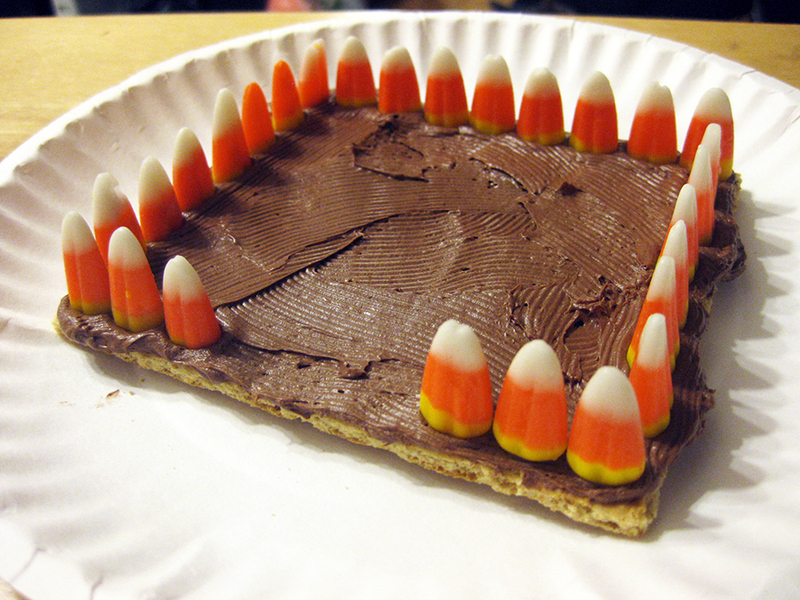 Step 2: Make a fence around the outer edges of the cracker with the candy corn, pointed side up. Step 3: Cut 3 Twizzlers in half, forming 6 equal parts*. Measure out the wire approximately the same length of the Twizzler halves. Using wire cutters, cut 6 pieces of wire. If you look at the cut end of the Twizzler, you’ll notice a hole. Gently feed the wire into that hole until the wire has reached the end. If you’re having trouble getting the wire all the way in, gently press the wire down onto a firm surface. If there is excess wire, use the wire cutters to clip off the ends. Repeat with remaining Twizzlers. * Note: You can cut the Twizzlers to whatever length you want. I wanted a small tree, so I cut them in half. You could also cut them in varying lengths to make the tree look more realistic. Step 4: Gently bend the tops of the Twizzlers to represent tree branches. Bend the bottom 1/2 inch of each branch to represent the roots. 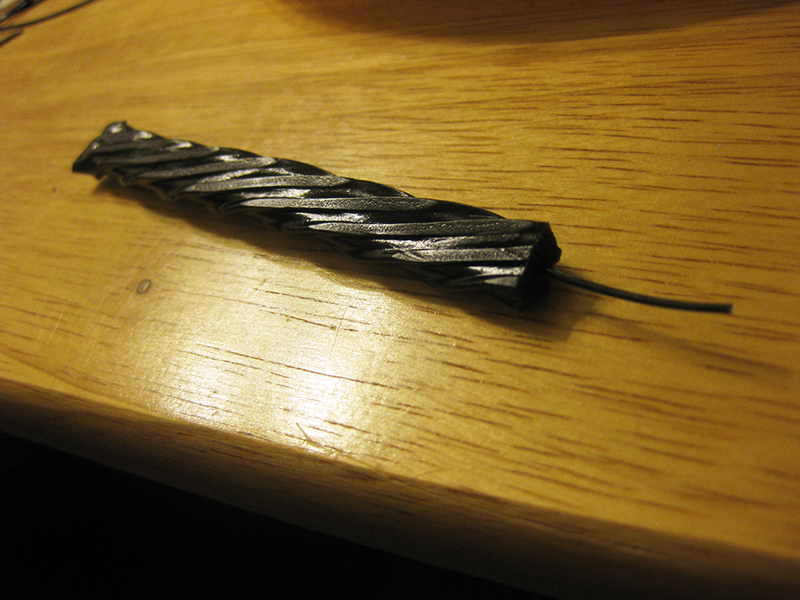 Cut another piece of wire about 5 inches long. Gather the tree branches together, roots facing outwards, and use the wire to secure the branches in place. Place the tree on the cracker — anywhere you want! Step 5: Place the pumpkins around the cracker, however many where ever you want. I used 3. If you purchased the Harvest mix of candy from the Dollar Tree, you should also have candy corn with a brown tip. I used 2 of those to form a gate. Ta-da! A beautiful, somewhat edible, centerpiece! Posted by SprinkleOfHappiness on September 13, 2014 in Holidays!